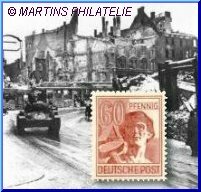 At the end of World War II Germany was divided in several zones, occupied by the allied military forces. We have all items of the occupied Zones in stock. Allied Occupation, AMG-Issues, French and Russian Zone with a large selection of the local issues.